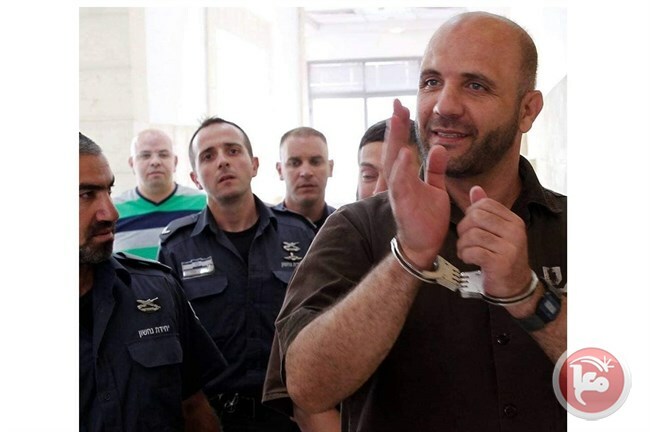 JERUSALEM (Ma’an) — The Israeli authorities decided to release a Palestinian prisoner, on the condition of banning him from entering Jerusalem City, on Thursday. Earlier Thursday, Israeli intelligence forces re-detained Yaqoub Mahmoud Abu Assab, 46, immediately upon his release from Israeli prison.Head of the Jerusalem Committee for Families of Prisoners, Amjad Abu Assab, said that Israeli intelligence forces re-detained his brother Yaqoub, 46, immediately upon his release from the Negev jail. A Ma’an reporter said that the Israeli authorities also imposed a bail of 1,000 ILS (US $270) on Abu Assab. Abu Assab added that his brother had just finished his 7-year-sentence.According to Abu Assab, the family received a phone call from the Israeli intelligence informing them of Yaqoub’s detention and that he was transferred to the Russian compound police station in Jerusalem.Yaqoub Abu Assab was detained in late 2011 for being a leader at the Hamas movement of Jerusalem; he was also previously detained several times during the past years and had spent a total of 15 years in Israeli prisons.